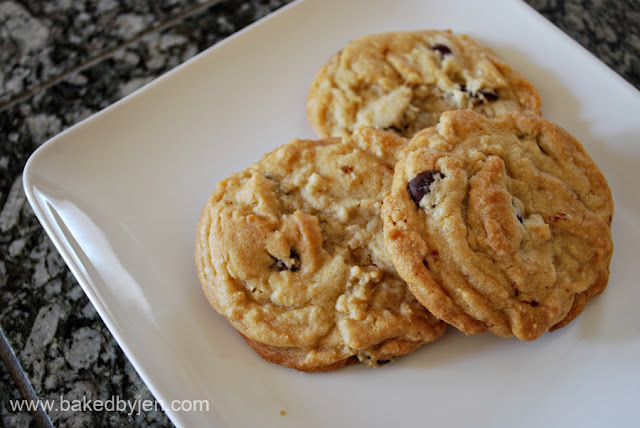 After trying the NY Times chocolate chip cookies I made last week, my sister commented that her favorite was still the copycat Levain Bakery chocolate chip walnut cookies I made awhile ago (but never blogged about for some reason until today). I was fortunate to have tried the original cookie right from the source while in New York a few years ago and it was as amazing as you could possibly imagine. However, I couldn't remember how this copycat recipe stacked up against all the cookies I have been making lately; so, in the kitchen I went again. Unfortunately, these cookies baked up very flat; nothing like the original - thick and chewy, chock full of chocolate and nuts. However, I blame it on over mixing the dough and using room temperature butter and not chilled butter. They tasted good nonetheless. Directions: In a medium sized bowl, combine the flours, salt, baking powder, baking soda, and corn starch. Whisk all the dry ingredients together. Put the white and brown sugars in a stand mixer bowl or large mixing bowl and mix until well combined and almost all lumps have disappeared. Add the chilled cubed butter and continue to mix at medium speed. Add the eggs, one at a time, continuing mixing until well incorporated. Add the dry mixture to the wet mixture in increments until fully incorporated. Mix in chocolate chips and walnuts by hand. Using a large spoon or ice cream scoop, distribute the dough onto baking trays lined with parchment paper or baking mat. Fill trays with 6 cookie dough balls, bake about 14-15 minutes. The cookies should be removed from the oven when they look slightly underdone. They will continue to cook as they cool on the tray. Remove from the tray after and onto a wire wrack to completely cool. Stores in an airtight container for up to 2-3 days. A friend and I hosted a bake sale at work to raise funds for the March of Dimes walk we'd be participating in this month. 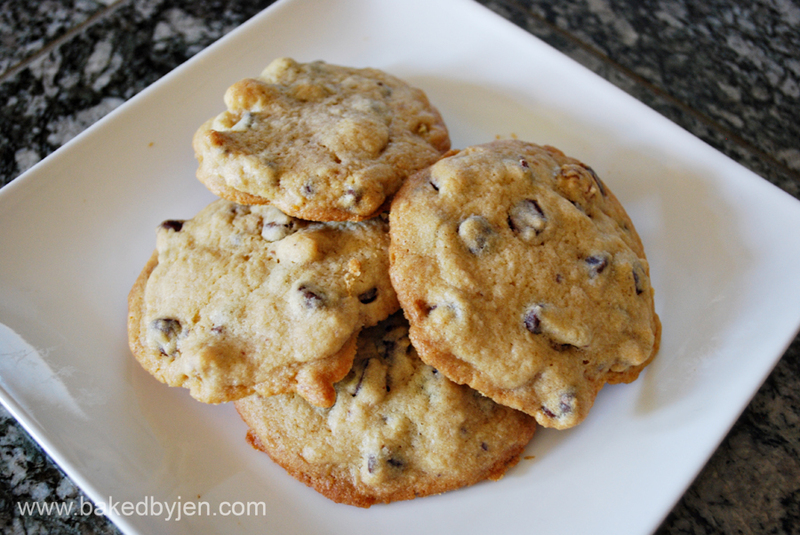 It was the perfect opportunity to try another chocolate chip cookie recipe from my to bake list. The reason it took me so long to get to this recipe is that you are required to refrigerate the dough for 24 hours; definitely a lot of patience on my part. These cookies came out thick and chewy in the middle but nice and crisp on the edges. Just the way I love my cookie chip cookies. It's difficult to pick a favorite or the best one anymore. Each of the chocolate chip cookies I have made yielded great results. What would you argue is the best homemade chocolate chip cookie? Whisk together the flours, baking soda, baking powder, and salt in a large bowl and set aside. Cream together the butter and sugars until light, about 5 minutes. Add the eggs one at a time, mixing well after each addition. Add the vanilla extract. Reduce the mixer to low and add the dry ingredients and mix well until just combined. Using a rubber spatula, stir in the chocolate chips. Scoop out 2 tablespoons of cookie dough, roll into a rough ball and place on the baking sheet. Repeat until you have 6 mounds of cookie dough on the baking sheet. Sprinkle with sea salt and bake until lightly golden brown, about 18 to 20 minutes. Transfer the parchment sheet or the nonstick baking mat off the tray to cool for about 10 minutes and then transfer the cookies to a rack to cool. Repeat with the remaining dough. Cookies keep in an airtight container for up to 3 days. 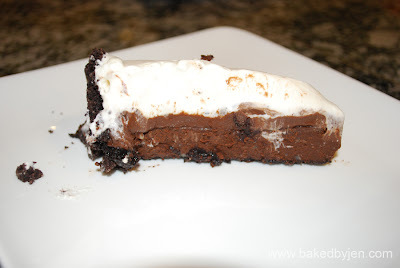 For my sister's boyfriend's birthday, I made a Mississippi Mud Pie to celebrate. The pie tasted a lot better than it looked. It was impossible to get a clean slice; I can't imagine how they did it in Baked Explorations. This cake was quite labor extensive but definitely worth it for the chocolate lover in your life. 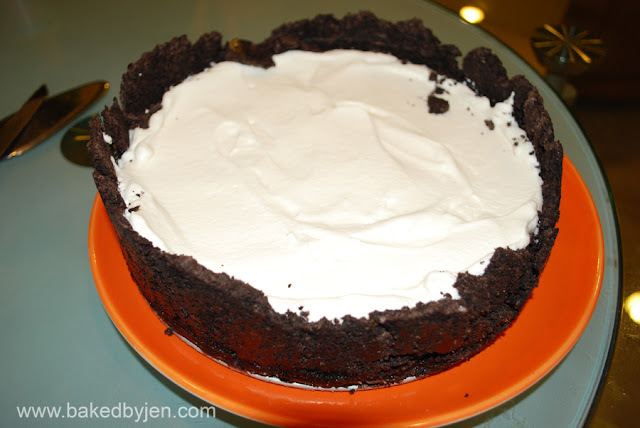 It starts with a chocolate cookie crust. Then a flourless chocolate cake. Followed by the chocolate pudding. Finished with whipped cream. It was a very dense and rich pie.